Put your logo in lights, literally. What more could you ask for? Introducing a 3-in-1 custom light-up pen where must-have technology meets a fantastic design. This unique pen is a bright new way to showcase your logo. As a giveaway, the pen is a promo classic! The Promotional Illuminated Curvaceous Stylus Pen is quickly becoming one of the most popular new pens on the market because of its multipurpose design. This slim, sleek tool functions as a writing instrument and tech accessory stylus as well as an illuminating billboard for your logo. 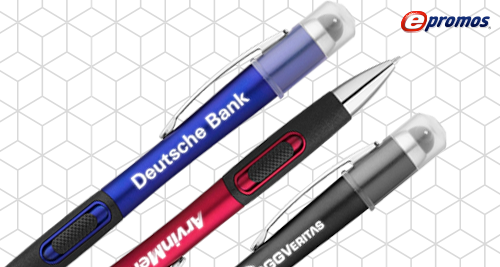 These innovative pens feature an interior light that will have your brand shining bright. When customers push the capacitive stylus button, this light-up pen will brightly display your logo. One click and your laser-engraved logo imprint is lit up! By the way, capacitive is just a big word that means this stylus uses the same electrical properties as the human touch to detect the user’s touch, allowing much finer scrolling precision. A stylus also reduces fingerprints on touch-screens, so it’s perfect for use on cellphones or tablets. These innovative pens work with cellphones including iPhones® and Androids™ as well as tablets such as the iPad®. This pen comes with a protective cap for the stylus, not only to safeguard the stylus, but also to prevent accidental light activation. A simple push of the soft stylus tip turns off the light. The light runs on one small lithium ion, non-replaceable battery. Please note that your logo will stand out on the pen whether it is illuminated or not. To activate this novelty pen, simply push the side-action button. This precision ballpoint writing tool writes in SureWrite™ black ink. The click-action, medium-point tip is activated by a push button, retracting into the pen when not in use. Prospects and employees can take advantage of its ergonomic shape by grabbing the rubberized, textured grip for hours of writing comfort. And, if you want even more functionality, we have included a metal clip to keep the pen handy throughout the entire day. This pen can be securely fastened to a pocket, on a notebook or to a book cover or stack of papers. This pen is made of plastic and has a shimmering metallic finish in five classic colors: metallic cobalt blue, metallic dark red, metallic black, chrome and silver. There is sure to be one that matches your brand. Its bright chrome accents give this pen an exclusive look. The total imprint area for your logo is 1.5”x0.25” on the 5.875″ barrel. And you have the option of imprinting on the front as well as the back! This is the perfect stylus pen combo for your tech-savvy clients. Or, you can hand out these budget-friendly giveaways at a tradeshow, convention, conference or college fair. These multi-functional promotional pens will certainly make a long-lasting impression on everyone! Light up promotional items are a hot trend — whether you’re looking for a unique trade show giveaway or for a pen at reception when clients are checking into your office. Call a Brand Consultant today and get this flashy promotional tool at the low price of $1.49 per pen. Best yet, ePromos also offers Free Shipping on this 3-in-1! Need Affordable Promo Items (That Are Actually Cool)?